Victoria line trains now run 36 trains per hour making it the second most frequent line in the world. 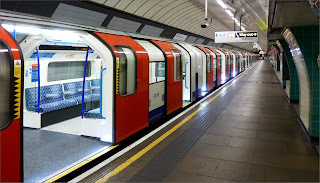 It means a train on the busy Victoria line, used by more than 700,000 passengers a day, every 100 seconds during morning and evening peak time. Tube bosses says the line will carry an extra 3,000 passengers an hour at the busiest times. The new timetable introduced earlier in the summer is the culmination of a £900 million upgrade of the line including new trains and much improved stations. With 36 trains an hour the Victoria line – from Brixton to Walthamstow Central – now offers one of the most frequent services in the world and beaten only by the Moscow Metro which runs trains every 95 seconds. The Victoria success is the result of a new automatic Siemens signalling system which allows trains to run closer together, which increases capacity, while still maintaining safe operation.